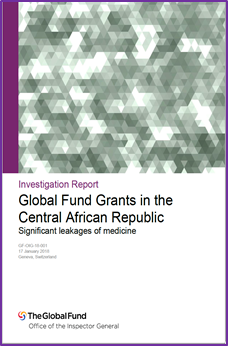 Medicines worth $198,334, bought using funds from two grants for malaria and TB/HIV, were lost due to theft and leakage in the Central African Republic (C.A.R.) over a period of 17 months, from January 2016 to May 2017. The losses primarily occurred at the central warehouse used by the principal recipient (PR), the International Federation of Red Cross and Red Crescent Societies (IFRC). The Secretariat alerted the Office of the Inspector General (OIG) to the losses. The OIG conducted an investigation in mid-2017; a report on its findings was published on 17 January. The C.A.R. is a country of 4.6 million people that has gone through periods of conflict for more than 30 years. The UNDP’s Human Development Index ranks the C.A.R. last among 188 countries. On Transparency International’s Corruption Perception Index, the C.A.R. ranks 159th out of 176 countries. The public sector is perceived to be highly corrupt. The C.A.R. is categorized by the Global Fund as a challenging operating environment and its grants are managed under the Additional Safeguard Policy. The Secretariat’s monitoring of the portfolio is limited due to the conflict. Between August 2013 and April 2016, the “local” fund agent was able to visit the country just once. Conditions are said to be improving, but site visits outside Bangui, the capital, were still not possible at the time of investigation. As of 9 October 2017, the Global Fund had disbursed a total of $143.7 million to the country, out of a total commitment of $153.0 million. The national medical store, the Unité de Cession du Médicament (UCM), an entity supervised by the Ministry of Health, was in charge of stock management at the main warehouse complex (until IFRC took over in January 2017). UCM reported a large theft of medicines in the fourth quarter of 2016, to IFRC and the national authorities, the OIG said. The medicines were mostly artemisinin-based combination therapies (ACTs), but there were also some antiretrovirals (ARVs). The OIG said that IFRC identified 173,798 blisters of ACTs and 1,296 blisters of ARVs as having been stolen. The quantities lost represented treatment for about 250,000 people. Following the report of the theft, key warehouse staff members believed to be involved were arrested, the OIG stated. The investigation revealed that in addition to this one-time theft, small quantities of medicines regularly went missing. (The OIG referred to these as “leakages.”) The OIG’s review of warehouse management records identified leakages amounting to 42% of the quantities IFRC had reported as theft. The OIG said that starting in April 2016, UCM made regular unsupported stock adjustments in its warehouse accounting system, reducing the recorded stock available. Before IFRC took over management of the warehouse, it monitored and supervised UCM every week. However, the OIG said, IFRC did not review warehouse records maintained by UCM, or investigate unsupported stock adjustments, or attempt to disrupt the leakages. IFRC also made unsupported stock adjustments once it was in charge of the stock management, the OIG reported. The OIG concluded that there was inadequate monitoring and supervision on the part of the PR. The investigation also found that there were weak supply chain processes and poor data quality at the health facility level. The OIG said that the health facilities it visited were not able to account for significant quantities of medicines received. They did not maintain basic stock records, the OIG said. Staff at the health facilities attributed the deficiencies to heavy workload, low technical capacity, limited resources and inadequate training from the IFRC. The OIG team visited a number of local markets in Bangui and found illicit ACTs available for sale in most of the markets. The OIG said that it was not able to establish whether the central warehouse or health facilities were the source of these medicines because of poor stock management throughout the entire stock management chain. The OIG observed that it was cheaper for a patient to purchase illicit medicines at the local market than it was to undergo malaria testing and a consultation at a health facility. The OIG said that on 5 October 2017, it provided IFRC and UCM with a description of its findings. IFRC provided some additional information, which the OIG said it took into account when it prepared its final report. UHC did not send a response. engaging an independent party to oversee its stock management and the hand-over of commodities at the end of the grants. The OIG proposed that the entire amount of the loss ($198,334) be recovered. committed to review warehouse management records. Following the investigation, the Secretariat undertook to determine a final recoverable amount and to pursue recovery. The Secretariat also agreed to assess the experience and capacity of the international PSM coordinator. On 8 September 2017, IFRC announced it will not implement the new malaria grant. In addition, IFRC was not selected as PR for the new TB/HIV grant when the C.A.R. submitted its funding request. The OIG said that the Global Fund will put in place an awareness-raising campaign to inform the public of the dangers of buying medicines in markets rather than through the formal health system. Jason Peat, Team Leader for Health in Complex Settings at IFRC, told Aidspan that there were a number of inaccuracies in the OIG’s report. Peat said that there is no direct evidence to support the OIG’s conclusion that medicines found in the market leaked from a warehouse or health facility. These medicines could have been sold by patients, he said. Peat said that it is not correct to say, as the OIG did in its report, that IFRC implemented actions to improve warehouse management and stock movement only in response to the OIG investigation. He said that these actions were implemented on an ongoing basis from the detection of the theft until today. Peat said that it is not correct to say, as the OIG did in its report, that IFRC agreed to implement measures to improve security in response to a request from the Global Fund. He said that this not a request from the Fund, but rather a two-way discussion. Peat said that the IFRC also proposed a number of additional security measures at the time of the theft (e.g. additional fencing, video cameras) which the Global Fund rejected as they were considered too expensive. is misleading. Peat said that the majority of this loss, close to $125,000, was due to a single theft at the warehouse in December 2016, and that the remaining loss was due to unsupported stock adjustments in the stock tracking software used in the warehouse. Peat said that IFRC informed the OIG that the adjustments could be due to a number of factors, including data entry errors and expired stocks being removed from the shelves and from the stock management system, but that the OIG concluded that they represented a loss of stock. is incorrect. Peat said that IFRC’s stock management had improved from when IFRC took over management of the warehouses on 31 January 2017.
is not correct. Peat said that IFRC and the Global Fund agreed that supervision was slow to start because (a) security constraints; and (b) the fact that IFRC was focused on ensuring the supply of medicines to all 632 Global Fund–supported health facilities and supporting the establishment of a national M&E reporting system. When the investigation was conducted, in May 2017, Peat said, IFRC had been implementing a rigorous monitoring and supervision protocol, as agreed with the Global Fund, since January of that year. IFRC did supervise UCM on a weekly basis as part of IFRC’s regular oversight of UCM. IFRC had communicated excess use of medicines to the Global Fund, the country coordinating mechanism and the Ministry of Health since 2014. IFRC was working with those actors to address this issue through training in treatment protocols and monthly reporting. A spokesperson for the OIG said that IFRC saw the findings on at least two occasions, as part of the OIG’s due process; that IFRC commented on the findings; and that the OIG took its comments into account. The spokesperson said that the OIG stood by the findings as presented in its report on the investigation. He said that the OIG does not agree with IFRC’s statements that there were inaccuracies in the report. For example, the spokesperson said, the OIG did not say that IFRC only implemented actions to improve warehouse management in response to its investigation. Indeed, he said, in three different places in the report, including in the very first paragraph, the OIG stated that security had improved since IFRC had reported the initial theft (which pre-dated the OIG investigation). IFRC has an article on its website about its experience as PR in the C.A.R.